Deutsche Telekom is ending its sponsorship of professional cycling immediately to distance its brand from the doping scandals that have blighted the sport it announced today.”We arrived at this decision to separate our brand from further exposure from doping in sport and cycling specifically,” said Hamid Akhavan, Chief Executive of Deutsche Telekom’s T-Mobile unit. 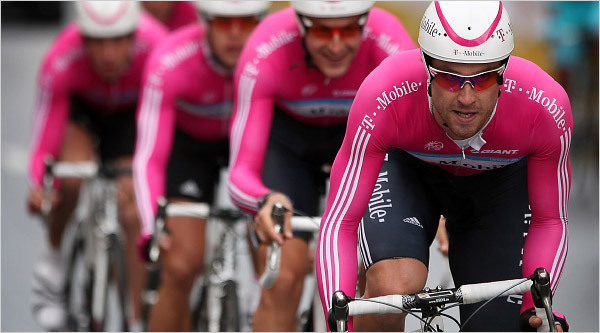 Deutsche Telekom ended sponsorship of both the men’s and women’s teams. It had been sponsoring cycling since 1991. The company said it was negotiating with Neuer Strassen Sport, the operator of the T-Mobile Team, over terminating a contract that was set to run until the end of 2010. It is, of course, disastrous news for cycling but it is difficult to dispute the commercial sense of the decision. Whoever said “there is no such thing as bad publicity” obviously hadn’t been around Pro Cycling. I suspect it was the inability to see an end to the scandals that finally did it for Telekom. As the contract, said to be worth $18 million a year, ran until 2010 I presume that Bob Stapleton will be able to run the team using Telekom’s pay off and will not be under any immediate pressure to find a new main sponsor. It is worth noting that T Mobile will continue to sponsor Bayern Munich so it would seem that the company believes that doping is not a major problem in football. This post is nothing more than an excuse to show an old photo that I have found. The “winner” is Keith Hardiman of the Liverpool Mercury. 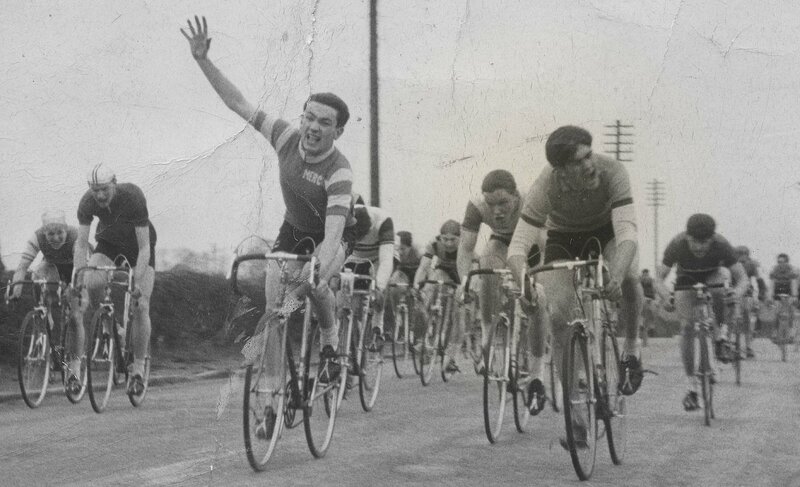 The race was held on the Bickerstaffe circuit on 27 April 1963 and I think it was promoted by the Walton C&AC. I have received a number of comments that I have been unduly harsh about Johan Museeuw. I don’t agree and as evidence of my admiration for the Lion of Flanders I re-print below a short piece that I placed on a club website more than three years ago. I suppose we all suspected that there was more to Johan Museeuw’s preparation than endless kilometres across the flatlands of West Flanders but it was still a shock to discover that the Lion of Flanders was under investigation for epo use. He was in Hamilton, Ontario last October but instead of being an outside chance for a second rainbow jersey he was reduced to hanging around the hotel trying to avoid the attention of your correspondent. The Belgian Federation had asked him to step down for the good of the sport which sounded both hypocritical and ominous. and his stolen victories. But I can’t. To me Johan is still a hero and his epic wins are not diminished. Maybe if he didn’t emit such an aura of quiet dignity. Maybe if he wasn’t so close to his family and his Flemish roots. Maybe if he had moved to Monaco or Switzerland to avoid the rapacious Belgian taxman. Maybe if he had moved to Tuscany to train in the sunshine. Maybe then I would think less of him, but he didn’t, he just carried on stacking in the miles. Whether battling into a gale off the North Sea or riding at sixty kms per hour behind his father’s moped he was the perfect role model for all of us who know the pain and joy of bike racing. I know it’s not the thing to be soft on doping or the causes of doping but in the absence of that mythical level playing field Johan’s still The Man. Jorg Jasche has been speaking at the Play The Game anti-doping conference in Iceland. UCI president Pat McQuaid said that he thought that there is no more organized doping in cycling, a statement Jaksche disagreed with. “Maybe I have just been unlucky, because I have been on six teams, and on all six there has been organized doping,” was Jorg’s response. Never lost for the wrong thing to say the UCI president attacked the many riders, who in the past year have told stories about doping use to different newspapers and TV stations. This, of course, includes Jörg Jaksche. ”When you get paid enough money to do something, your objectivity tends to go out the window,” Pat McQuaid said. Now it seems to me that although it would be best if riders fessed up for the good of the sport they should be encouraged to speak up even if partly motivated by article or book sales. Surely as a son of Ireland Pat appreciates the theraputic value of confession? There are of course seven teams and it seems from later comments that he was excluding Tinkoff from the role of dishonour.